Biochemistry Laboratory CHU Farhat HACHED, Sousse, Tunisia. ABSTRACT: Adiponectin has been schown to protect from insulin resistance, demonstrate anti-inflammatory and anti-atherosclerotic effects and be involved in the pathogenesis of metabolic syndrome (MS). We aimed to assess the association between serum adiponectin concentration, insulin resistance and various risk factors of MS and to investigate the relationship between the single nucleotide polymorphism (SNP) +45 T>G ( rs 2241766) in the adiponectin (ADIPOQ) gene and the risk of MS. 200 patients with MS and 250 healthy controls were enrolled in this study. The level of fasting serum insulin, glucose, and lipid levels were measured. Insulin resistance was estimated using homeostasis model of assessment for insulin resistance (HOMA-IR). Serum adiponectin levels were measured by enzyme-linked immunosorbent assay and the SNP +45 T>G in the ADIPOQ gene was performed by the polymerase chain reaction-restriction fragment length polymorphism method. MS patients had a significantly higher levels of HOMA-IR (p<0.001) and lower serum adiponectin concentrations (p<0.001) compared to controls. 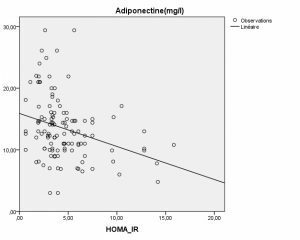 Multiple regression analysis showed that serum adiponectin levels was associated negatively with HOMA-IR (r=-0.307; p=0.001) and positively with high-density lipoprotein cholesterol (HDL-C) (r=0.369; p=0.000) in MS patients. In addition, there was no significant association between genotypes of rs 2241766 and the risk of MS. In conclusion, adiponectin is known to play key regulator of insulin sensitivity, endothelial function and lipid metabolism. Our findings confirm the associations of hypoadiponectinemia with MS and gave evidence that the SNP+45 T>G polymorphism in the gene of ADIPOQ is not associated with MS.
INTRODUCTION: Insulin resistance is an important factor in the development of metabolic syndrome (MS), the complex disorder characterized by abdominal obesity, hypertension, dyslipidemia and increased plasma glucose. The MS has been widely associated with incident type 2 diabetes (T2D) and cardiovascular diseases (CVD) 1, 2. Development of the MS is influenced by genetic and environmental factors and their interaction with each other 3, 4. Adipose tissue has been recognized as an important endocrine organ, secreting a variety of adipokines, which are involved in the regulation of energy homeostasis and insulin sensitivity 5. Adiponectin, the most abundant adipocyte secreted hormone in blood, is termed a “beneficial” adipokine due to its anti-inflammatory, anti-atherogenic and anti-diabetic effects 6, 7. Conversely, hypoadiponectinemia is associated with T2D, MS, obesity and insulin resistance, while functional studies in animal models have shown that increased adiponectin levels by supplementation of adiponectin attenuates insulin resistance by reducing the triacylglycerol content in muscle and liver 8. Moreover, serum adiponectin concentrations are negatively correlated with triglycerides (TG) and positively with high-density lipoprotein cholesterol (HDL-C) 9, 10. ADIPOQ gene which encodes adiponectin is located on chromosome 3q27 11. It consists of three exons and two introns spanning a 16 Kb 12. In this region, genome-wide scans have mapped a susceptibility locus for T2D, coronary artery disease, insulin resistance and MS 11-16. Several single nucleotide polymorphisms (SNP) at this locus have been reported individually or in combination as haplotypes and the most commonly studied are rs17300539 (-11391G>A) and rs266729 (-11377C>G) in the promoter region and rs2241766 (+45T>G) and rs1501299 (276G>T) in exon 2 and intron 2, respectively 17. SNP +45 T > G is a synonymous mutation (GGT→GGG, Gly15Gly) at exon 2 and Yang et al. revealed that this T/G substitution may affect expression of adiponectin by affecting RNA splicing and stability18. Others studies showed that the G allele of SNP +45 T > G has an association with T2D, insulin resistance and MS in several populations even though the findings have been controversial. However, little is known about association of SNP +45 T>G (rs2241766) with CVD. Therefore, the aim of this case-control study is, in one hand, to evaluate the relationship between SNP +45 T>G in the adiponectin gene and the risk of MS, and, in the other hand, is to investigate the possible association between circulating total adiponectin levels with insulin resistance and biochemical parameters in Tunisian patients with MS.
Study population: This study included 450 participants (200 subjects with MS and 250 others without MS) who are volunteers from external consultations from dispensary Kalaa Kebiraa, Sousse Tunisia. These subjects had no past history of CVD, no history of prescribed medicine. The main exclusion criteria were: pediatric study populations, age > 90 years old, several renal failures, an acute infection, thyroid problem or heart disease. This study was approved by the local Ethics Committee of Farhat Hachet Hospital of Sousse, Tunisia, in accordance with the Declaration of Helsinki. Definition of Metabolic Syndrome: MS was defined clinically, based on the presence of three or more of the five following components according to the National Cholesterol Education Program Adult Treatment Panel III (NCEP ATPIII) criteria: abdominal obesity (defined as waist circumference ≥ 102 cm for men and ≥ 88 cm for women); TG ≥ 150 mg/dl (1.7 mmol/l); HDL-C < 40 mg/dl (1.03 mmol/l) in men or < 50 mg/dl (1.29 mmol/l) in women; fasting glucose ≥ 100 mg/dl (5.6 mmol/l) or medication for diabetes; and blood pressure ≥ 130/85 mmHg or on antihypertensive medication19. Anthropometric measures and blood pressure: After obtaining a consent agreement from participant, weight and height were measured. Waist circumference (WC) was measured midway between the lowest rib and the iliac crest on standing subjects. Body Mass Index (BMI) was calculated as weight (kg) divided by height2 (m). Arterial blood pressure was measured in participant rested and seated for at least 5 minutes using an automated blood pressure monitor. Laboratory measurements: Blood was collected following overnight fasting, and plasma and serum samples were either used immediately for analysis or were stored frozen at -20°C. Fasting blood glucose levels, urea, creatinine and non esterified fatty acids (NEFA) were measured with colorimetric essay (Randox-Antrim, UK; CX5 and CX9-BECKMANN). The lipid profile included total cholesterol (TC), serum TG, HDL-C, apolipoprotein A1(Apo A1), apolipoprotein B(Apo B), lipoprotein Lp(a) as well as liver function including alanine aminotransferase (ALAT), aspartate transaminase (ASAT), gammaglutamyl transpeptidase (Gamma-GT), glycated hemoglobin (HbA1C), high-sensitivity C-reactive protein (hs_CRP), uric acid, Cystatin C were performed using an autoanalyzer (COBAS Integra 400, Roche Diagnostics, Basel, Switzerland). Low density lipoprotein cholesterol (LDL-C) was determined by Friedewald equation 20. Serum insulin and homocystein concentrations were measured by an immunoassay (Abbott AxSYM-Diagnostics, Wiesbaden, Germany) and HOMA-IR were calculated using the formula = [Fasting insulin (µU/ml) x Fasting glucose (mmol/L)/22.5] 21. Serum adiponectin levels were determined using a commercially available enzyme-linked immunosorbent assay (ELISA) kit (Abcys Human Adiponectin ELISA). SNP 45 T/G genotyping: Genomic DNA was extracted from peripheral blood using standard salting-out procedure. Genotyping of SNP 45 T/G in the study population (450 individuals) was performed using polymerase chain reaction-restriction fragment length polymorphisms (PCR-RFLP). the PCR procedures were performed using a 18 μl reaction volume containing: 3.6 μl of 5X buffer (50 mM KCl, 20 mM Tris-HCl, pH 8.4), 0.72 μl of 25 mM MgCl2, 0.36 μl of 10 uM of each allele specific primers [sense primer (5’ GATCAAGGTGGGCTGCAATA 3’) and antisense primer (5’ AGTCGTGGTTTCCTGGTC AT 3’)], 0.36 μl of 20 mM dNTP, 0.09 U of Taq DNA polymerase (Promega) and 1 μl of 100 ng of template DNA and water. Briefly, the PCR for the SNP 45 T/G in the adiponectin gene consisted of a 5-minute-denaturation step at 94°C followed by 35 cycles at 94°C for 30 s, 51° for 30s, 72°C for 30 s, and a final extension at 72°C for 7 min. The PCR products we digested overnight with 2 units of AvaI (Jena Bioscience GmbH, Germany) at 37°C and separated on 3% agarose gels. RFLP bands were visualized under UV light with ethidium bromide staining. The Adip TT genotype was expected to show a single band (246 bp) whereas GG genotype was expected to show two DNA bands at the positions of 220 bp and 26 bp, and the heterozygote +45T/G was expected to have three bands (246 bp, 220 bp and 26 bp). Statistical evaluation: The statistical package for the social sciences (SPSS) version 20 for Windows (SPSS Inc., Chicago, IL, USA) was used for the statistical analysis. Parametric data are expressed as the mean ± standard deviation. Means were compared using the Student test for independent samples. The relations between variables were assessed with Pearson's and Spearman correlations analysis. A P value ≤ 0.05 was considered as significant. Epidemiological characteristics of study population: Table 1 presents the baseline demographic and serum biochemical measurements of patients with and without MS. The subjects comprised 200 subjects with MS aged 57.63±12.06 and 250 control subjects aged 50.13±13.05 years. Individuals with MS had significantly higher levels of BMI, waist circumference, fasting blood glucose, TG, systolic blood pressure, diastolic blood pressure, fasting serum insulin, HOMA-IR, uric acid, cyctatin C, hs-CRP, NEFA and lower levels of HDL-C and adiponectin than those without MS.
Abbreviations: alanine aminotransferase (ALAT), aspartate transaminase(ASAT), apolipoprotein A1(Apo A1), apolipoprotein B(Apo B), body mass index (BMI), gammaglutamyl transpeptidase (Gamma-GT), glycated hemoglobin (HbA1C), high density lipoprotein cholesterol (HDL-C), homeostasis model assessment index for insulin resistance (HOMA-IR), high-sensitivity C-reactive protein (hs_CRP), lipoprotein Lp(a), low density lipoprotein cholesterol (LDL-C), metabolic syndrome (MS), non esterified fatty acids (NEFA), total cholesterol (TC), triglycerides(TG), Data presented as mean±standard deviation. Data for hs-CRP were presented as median (interquartile range). 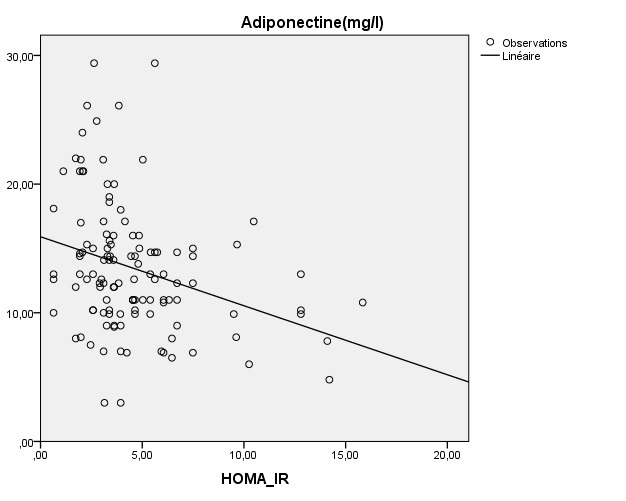 Correlation between serum adiponectin and clinical parameters: Pearson and Spearman correlation analysis showed that serum adiponectin level had a negative correlation with HOMA-IR (r = −0.307; p=0.001) (Fig.1) and TG (r = −0.209; p = 0.012). Conversely, adiponectin showed a positive relationship with HDL cholesterol (r = 0.369; p = 0.000) (Fig. 2). FIG. 1 : THE CORRELATION BETWEEN ADIPONECTIN AND HOMA-IR (r = −0.307; p=0.001). FIG. 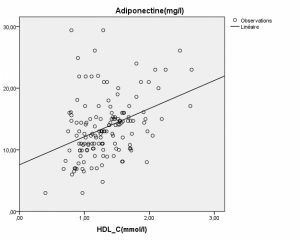 2 : THE CORRELATION BETWEEN ADIPONECTIN AND HDL-C (r = 0.369; p=0.000). Genotype and allele analysis: The genetic and allelic frequencies of ADIPOQ rs2241766 (+45T>G) among the cases and the controls are shown in Table 2. There was no differential distribution of genetic or allelic frequencies in ADIPOQ rs2241766 (+45T>G) site between the cases and the control group (P > 0.05). Genotypes are reported as number with percent in parentheses. *Two-tailed chi-square test (χ2). 95%CI = 95% confidence interval. OR: odds ratio, CI: confidence interval, Interestingly, the distribution of SNP +45 T>G (rs2241766) genotypes and alleles frequencies were no significantly different between MS patients and controls (p>0.05). DISCUSSION: The findings of the present study showed that, the fasting serum adiponectin concentration is significantly lower in subjects with MS in comparison to healthy controls while insulin and HOMA of insulin resistance index are significantly higher in MS group. Also, we repot an inverse correlation between serum adiponectin concentration and insulin resistance. Adiponectin, an adipocyte-derived cytokine, modulates glucose metabolism and insulin resistance by the 5’-adenosine monophosphate activated kinase signaling pathway, and decreases also free fatty acid concentrations by stimulating fatty acid oxidation in muscle 22. Thus, adiponectin may be a strong predictor for the occurrence of insulin resistance as well as a potential link between MS and its cardiovascular consequences 16, 23-27. Hypoadiponectinemia has been demonstrated to be associated with the insulin resistance, obesity, diabetes and MS. Furthermore, several studies demonstrated the important role of adiponectin in the regulation of others physiological processes, including lipid metabolism, endothelial function, inflammatory response and cytokine signalling 28. Dyslipidemia is known as a major risk factor of insulin resistance and MS. Among several proposed lipid markers, TG and HDL-C are key metabolic abnormalities in patients with insulin resistance and a positive correlation between circulating adiponectin levels and HDL-C concentration has been indicated from various studies 9, 10, the same correlation was found among our cases. Indeed, according to other study 29, there is an inverse relationship between adiponectin levels and TG levels and hypertriglyceridemia is often associated with prevalence diseases, such as diabetes, CVD and MS 30. The MS is a cluster of cardiometabolic alterations that include the presence of high blood pressure, insulin resistance, dyslipidemia, and abdominal obesity 31. Obesity is commonly associated with inflammatory response, characterized by abnormal adipokine production, and the activation of proinflammatory signalling pathways resulting in the induction of several biological markers of inflammation 32. HsCRP, marker of low-grade chronic inflammation, has been associated with hypertension, central obesity and other components of the MS 33. Although adiposity is closely related to inflammation, it is thought that insulin resistance and inflammation are the main components of MS and CVD 34, 35. In our study, the concentrations of hsCRP were higher in subjects with MS than those without MS.
Adiponectin promotes fatty acid oxidation and glucose uptake and has shown strong anti-inflammatory and antiatherogenic effects 6, 7, 36. This characteristics and the serum levels and of adiponectin are regulated by gene expression, and analysis of the adiponectin gene sequence reveals a large number of SNPs. In recent years, there have been many reports about the association between adiponectin SNPs and various diseases. Although previous studies have examined the role of adiponectin SNPs in obesity, T2D and CVD11-15, 37. In this study, we did not find a significant association between the +45 T>G (rs2241766) in the ADIPOQ gene and MS in Tunisian population. Our results are similar to those of others study in different ethnic populations 38, 39. However, the association of SNP +45 T>G with T2D, insulin resistance and obesity both in healthy individuals and T2D patients, has been investigated in several populations including the Tunisian ones 12, 14, 40-42. Interestingly, polymorphism +45T>G showed a strong association with body adiposity in diabetic women. Such an association is consistent with the autocrine function of adiponectin in regulating fat accumulation at adipose tissue 43. Some main limitations of our study merit consideration. First, this study should be supported by further studies with larger populations. Second, we tested only one SNP of ADIPOQ gene that limited the possibilities to examine a wide range of haplotype combinations. Third, our analyses were based on a measurement of total concentrations of serum adiponectin while in human plasma, adiponectin circulates in trimeric, hexameric and oligomeric forms which might be responsible for adiponectin insulin sensitizing effects 44. In conclusion, we investigate that reduced adiponectin levels may play an important causal role in the development of insulin resistance and MS as defined by the NCEP ATP III criteria. Thus, the progress of adiponectin analogues holds great promise for clinical use in the prevention and treatment of MS. Furthermore, there are no significant differences in the genotypes and allele distribution of the SNP +45 T>G in the adiponectin gene among subjects with MS and controls in Tunisian population. This lack of association mostly likely reflects the complex pathogenesis of MS. Further functional studies need to be performed to investigate thoroughly the underlying cellular mechanisms. This signaling pathway will provide practitioners with important targets for therapeutic strategies aimed at limiting the inflammatory response involved in the development of MS.
ACKNOWLEDGEMENTS: We owe special thanks to the patients and volunteers for their collaboration and the staff of the biochemistry laboratory Farhat Hached University hospital and dispensary Kalaa Kebira, Sousse (Tunisia) for their precious technical support. Shin JA, Lee JH, Lim SY, Ha HS, Kwon HS, Park YM et al : Metabolic syndrome as a predictor of type 2 diabetes, and its clinical interpretations and usefulness. J Diabetes Investig 2013; 4:334-43. Liang KW, Lee WJ, Lee WL, Liao YC, Wang KY, Lee IT, et al: Circulating adipokines and insulin resistance in subjects with combined cardiac and metabolic syndrome X. Diabetol Metab Syndr 2015; 7: 1-8. Panizzon MS, Hauger RL, Sailors M, et al. A new look at the genetic and environmental coherence of metabolic syndrome components. Obesity (Silver Spring) 2015; 23:2499–507. Brown AE, Walker M: Genetics of Insulin Resistance and the Metabolic Syndrome. Curr Cardiol Rep 2016; 18: 1-8. McGown C, Birerdinc A, Younossi ZM: Adipose tissue as an endocrine organ. Clin Liver Dis 2014; 18: 41-58. Ohashi K, Ouchi N, Matsuzawa Y: Anti-inflammatory and anti-atherogenic properties of adiponectin. Biochimie 2012; 94: 2137-2142. Turer AT, Scherer PE: Adiponectin: mechanistic insights and clinical implications. Diabetologia 2012; 55: 2319-2326. Yamauchi T, Kamon J, Waki H, et al : The fat-derived hormone adiponectin reverses insulin resistance associated with both lipoatrophy and obesity. Nat Med 2001;7:941–6. Geloneze B, Pereira JA, Pareja JC, Lima MM, Lazarin MA, Souza IC, et al: Overcoming metabolic syndrome in severe obesity: Adiponectin as a marker of insulin sensitivity and HDL-cholesterol improvements after gastric bypass. Arq Bras Endocrinol Metabol 2009; 53:293–300. Eslamian M, Mohammadinejad P, Aryan Z, Nakhjavani M and Esteghamati A: Positive Correlation of Serum Adiponectin with Lipid Profile in Patients with Type 2 Diabetes Mellitus is Affected by Metabolic Syndrome Status. Arch Iran Med 2016; 19: 269-74. Vionnet N, Hani EH, Dupont S, Gallina S, Francke S, Dotte S, et al: Genomewide search for type 2 diabetes-susceptibility genes in French whites: evidence for a novel susceptibility locus for early-onset diabetes on chromosome 3q27-qter and independent replication of a type 2-diabetes locus on chromosome 1q21-q24. Am J Hum Genet 2000; 67:1470–80. Mtiraoui N, Ezzidi I, Turki A, Chaieb A, Mahjoub T, Almawi WY: Single-nucleotide polymorphisms and haplotypes in the adiponectin gene contribute to the genetic risk for type 2 diabetes in Tunisian Arabs. Diabetes Res Clin Pract 2012 ; 97: 290-297. Tu Y, Yu Q, Fan G, Yang P, Lai Q, Yang F, et al: Assessment of type 2 diabetes risk conferred by SNPs rs2241766 and rs1501299 in the ADIPOQ gene, a case/control study combined with meta-analyses. Mol Cell Endocrinol 2014; 396:1-9. Yao M, Wu Y, Fang Q, Sun L, Li T, Qiao H: Association of ADIPOQ Variants with Type 2 Diabetes Mellitus Susceptibility in Ethnic Han Chinese from Northeast China. J Diabetes Investig 2016; 1:1-7. Ohashi K, Ouchi N, Kihara S, Funahashi T, Nakamura T, Sumitsuji S et al : Adiponectin I164T mutation is associated with the metabolic syndrome and coronary artery disease. JACC Clin Electrophysiol 2004; 43: 1195-1200. Zhuo Q, Wang Z, Fu P, Piao J, Tian Y, Xu J, et al: Comparison of adiponectin, leptin and leptin to adiponectin ratio as diagnostic marker for metabolic syndrome in older adults of Chinese major cities. Diabetes Res Clin Pract 2009; 84:27–33. Han LY, Wu QH, Jiao ML, Hao YH, Liang LB, Gao LJ, et al : Associations between single-nucleotide polymorphisms (+45T > G, +276G > T, −11377C > G, −11391G > A) of adiponectin gene and type 2 diabetes mellitus: a systematic review and meta analysis. Diabetologia 2011;54:2303–14. Yang WS, Tsou PL, Lee WJ, Tseng DL, Chen CL, Peng CC, et al : Allele-specific differential expression of a common adiponectin gene polymorphism related to obesity. J Mol Med 2003;81:428–34. Expert Panel: Third report of the national cholesterol education program (NCEP) expert panel on detection, evaluation, and treatment of high blood cholesterol in adults (adult treatment panel III) final report. Circulation 2002; 106: 3143–421. Friedewald WT, Levy RI, Fredrickson DS: Estimation of the concentration of low-density lipoprotein cholesterol in plasma, without use of the preparative ultracentrifuge. Clinical chemistry 1972; 18: 499-502. Haffner SM, Miettinen H, Stern MP: The homeostasis model in the San Antonio Heart Study. Diabetes Care 1997; 20: 1087-92. Raucci R, Rusolo F, Sharma A, Colonna G, Castello G, Costantini S: Functional and structural features of adipokine family. Cytokine 2013; 61: 1-14. Siasos G, Tousoulis D, Kollia C, Oikonomou E, Siasou Z, Stefanadis C, et al : Adiponectin and cardiovascular disease: mechanisms and new therapeutic approaches. Curr Med Chem 2012;19:1193–209. Borges MC, Lawlor DA, de Oliveira C, White J, Horta BL, Barros AJ: Role of Adiponectin in Coronary Heart Disease Risk: A Mendelian Randomization Study. Circ Res 2016; 22: 491-9. Zaletel J, Barlovic DP, Prezelj J: Adiponectin-leptin ratio: a useful estimate of insulin resistance in patients with Type 2 diabetes. J Endocrinol Invest 2010; 33:514–8. Hao G, Li W, Guo R, Yang JG, Wang Y, Tian Y, et al: Serum total adiponectin level and the risk of cardiovascular disease in general population: a meta-analysis of 17 prospective studies. Atherosclerosis 2013; 228:29–35. Lim CC, Teo BW, Tai ES, Lim SC, Chan CM, Sethi S, et al: Elevated serum leptin, adiponectin and leptin to adiponectin ratio is associated with chronic kidney disease in asian adults. PLoS One 2015; 10: 1-11. Li ZY, Wang P, Miao CY: Adipokines in inflammation, insulin resistance and cardiovascular disease. 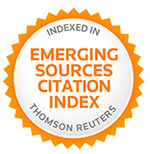 Clin Exp Pharmacol Physiol 2011; 38:888–96. Ascaso JF, Millán J, Mateo-Gallego R, Ruiz A, Suarez-Tembra M, Borrallo RM et al: Prevalence of metabolic syndrome and cardiovascular disease in a hypertriglyceridemic population. Eur J Intern Med 2011; 22:177-81. Gobato AO, Vasques AC, Zambon MP, Barros Filho Ade A, Hessel G: Metabolic syndrome and insulin resistance in obese adolescents. Rev Paul Pediatr 2014; 32:55-62. Gasparyan AY, Ayvazyan L, Mikhailidis DP and Kitas GD: Mean platelet volume: a link between thrombosis and inflammation? Current PharmaceuticalDesign 2011; 17: 47–58. Abu-Farha M, Behbehani K and Elkum N: Comprehensive analysis of circulating adipokines and hsCRP association with cardiovascular disease risk factors and metabolic syndrome in Arabs. Cardiovasc Diabetol 2014; 13: 1-10. Luna-Luna M, Medina-Urrutia A, Vargas-Alarcon G, Coss-Rovirosa F, Vargas-Barron J, Perez-Mendez O: Adipose tissue in metabolic syndrome: Onset and Progression of Atherosclerosis. Arch Med Res 2015; 46:392–407. Jung UJ, Choi MS: Obesity and its metabolic complications: the role of adipokines and the relationship between obesity, inflammation, insulin resistance, dyslipidemia and nonalcoholic fatty liver disease. 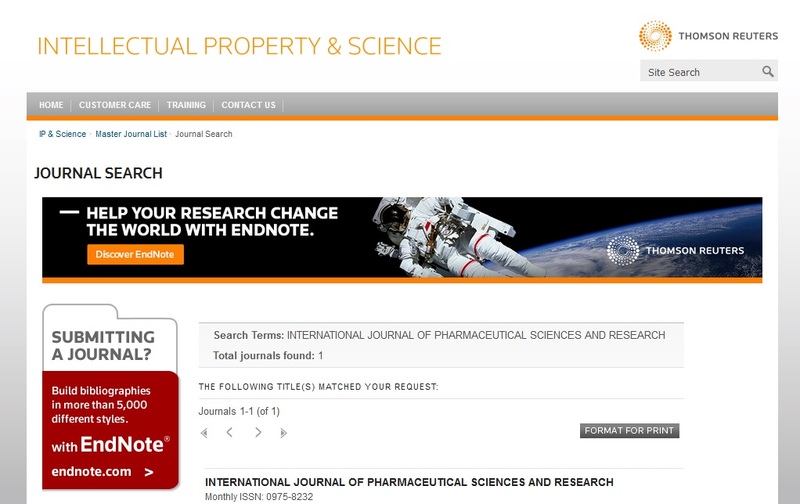 Int J Mol Sci 2014; 15:6184–223. Kim MJ, Nagy LE, Park PH: Globular adiponectin inhibits ethanol-induced reactive oxygen species production through modulation of NADPH oxidase in macrophages: involvement of liver kinase B1/AMP-activated protein kinase pathway. Circ Res 2016; 22:491-9. Peters KE, Beilby J, Cadby G, Warrington NM, Bruce DG, Davis WA et al: A comprehensive investigation of variants in genes encoding adiponectin (ADIPOQ) and its receptors (ADIPOR1/R2), and their association with serum adiponectin, type 2 diabetes, insulin resistance and the metabolic syndrome. BMC Med Genet 2013; 25:1471-2350. Ranjith N, Pegoraro RJ, Shanmugam R: Obesity-associated genetic variants in young Asian Indians with the metabolic syndrome and myocardial infarction. Cardiovasc J Afr 2011; 22(1):25-30. Mohammadzadeh G, Ghaffari MA, Heibar H and Bazyar M: Association of two Common Single Nucleotide Polymorphisms (+45T/G and +276G/T) of ADIPOQ Gene with Coronary Artery Disease in Type 2 Diabetic Patients. Iran Biomed J 2016; 20:152-60. Han LY, Wu QH, Jiao ML, Hao YH, Liang LB, Gao LJ, et al: Associations between single-nucleotide polymorphisms (+45T > G, +276G > T, −11377C > G, −11391G > A) of adiponectin gene and type 2 diabetes mellitus: a systematic review and meta-analysis. Diabetologia 2011; 54:2303–14. Takhshid MA, Haem Z, Aboualizadeh F: The association of circulating adiponectin and + 45 T/G polymorphism of adiponectin gene with gestational diabetes mellitus in Iranian population. J Diabetes Metab Disord 2015; 14: 1-7. Jacobi SK, Ajuwon KM, Weber TE, Kuske JL, Dyer CJ, Spurlock ME: Cloning and expression of porcine adiponectin, and its relationship to adiposity, lipogenesis and the acute phase response. J Endocrinol 2004; 182: 133–144. Lara-Castro C, Luo N, Wallace P, Klein RL, Garvey WT. Adiponectin multimeric complexes and the metabolic syndrome trait cluster. Diabetes 2006; 55:249–59. Sahli S, Khlifi L, Jaballah A, Khelil S, Bouzidi N, Chahed H, Ferchichi S and Miled A: Evaluation of serum adiponectin and adipoq +45 T>G polymorphism with metabolic syndrome in tunisian population. Int J Pharm Sci Res 2017; 8(3): 1294-00.doi: 10.13040/IJPSR.0975-8232.8(3).1294-00. Authors Address: Biochemistry Laboratory CHU Farhat HACHED, Sousse, Tunisia.